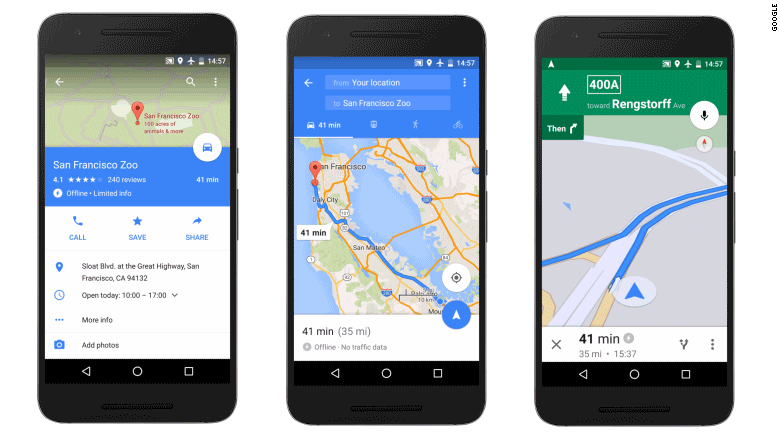 Whether you have limited or low data or you're stuck in a country road with spotty service, Google's Maps will come to the rescue ... offline. Prior to Tuesday's app update, Google (GOOG) Maps worked offline much like our old school physical paper maps -- it just showed a visual of an area. Now, Google says you can download any area of the world in a single click and get full, turn-by-turn navigation the next time you are without internet. Google previewed this feature at this year's Google I/O developers conference in May.